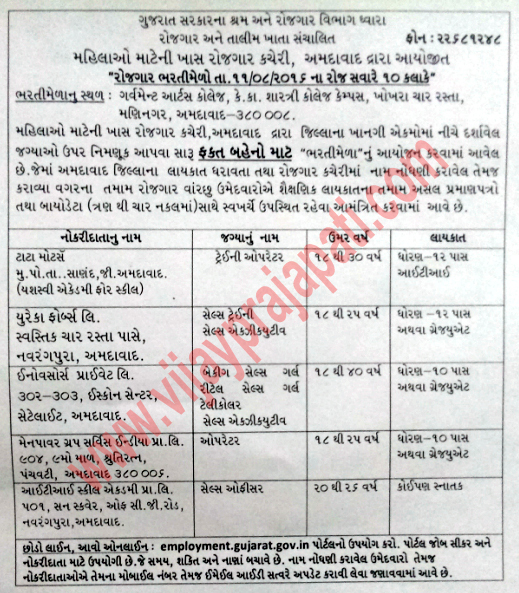 Employment and Training Department, Ahmedabad has published Advertisement for Rojgar bharti mela at Ahmedabad. Trainee Operator , Sales Trainee , Sales Executive , Banking Sales Girl, Retail Sales Girl, Tele Caller, Sales Executive, Operator , Sales Officer. Venue : Government Arts College, K.K.Shashtri College Campus, Khokhra Char Rasta, Maninagar, Ahmedabad - 380008. Walk-in-Interview : 11-08-2016 at 10:00 a.m.